The Criterium du Dauphiné is known as one of the most mountainous races on the calendar but before the climbers get a chance to shine, the strongest sprinters and classics specialists usually have a couple of opportunities. With no prologue in the 2015 edition of the French race, those riders will be keen to grab one of those already on the first day but to get the chance to take the first yellow jersey they will have to survive a significant amount of climbing that will send most of the fast finishers out the back door. Most national tours visit the nation’s capital at some point of the race. However, that has not always been the case for the Tour de Suisse which has not visited Bern since 2009. This year the capital is back on the course and will host the finish of the race like it did in 6 years ago. In fact, the final two stages will take place on the same 38.4km circuit around the capital as stage 8 will be a circuit race on the course for the stage 9 time trial. With its lumpy profile and category 3 climb close to the finish, it is a perfect race for aggressive riders and strong sprinters who will love to take one final chance in a race that suits them down to the ground. The stage is made up of four laps of the 38.7km circuit (it is slightly longer than the TT course as the start and finish aren’t located at the same place in the final stage) and as the first part of the first lap will be neutralized, the overall distance is 152.5km. After a short descent, the first part of the circuit is almost completely flat and brings the riders into the hilly terrain on the southwestern part of the country. After 6km of racing, the road gradually starts to rise before the riders hit the bottom of the category 3 Liebewill (800m, 9.25%). The summit is located 22.6km from the finish and leads to another short uphill section that culminates at the highest point of the course with15.9km to go. From there, the road is mainly descending but there’s a small climb (1.1km, 5.2%) to break the legs with 10km to go. The descent ends 3.7km from the finish and then the riders go up the category 3 Aargauerstalden climb (400m, 4.25%) whose summit is located with 2.5km from the finish. From there, the road is almost completely flat. The finale is very technical as there are turns with 2.5km, 1.8km and 1.5km to go. There is a left-hand turn with 1.1km to go and right-hand turns just 800m and 200m from the finish line. In 2009, Fabian Cancellara beat Tony Martin in a lumpy time trial in Bern on the final day of the race to seal his overall victory. One year earlier he surprised the sprinters in a road stage on the final day when he beat Philippe Gilbert in a 2-rider sprint. In 2007, the Swiss won the time trial on the final day while it was Jan Ullrich who ended his professional career by winning the time trial and the overall in Bern in 2006. Today was a nice sunny day in Switzerland but there is a big risk that the riders will face rain for their final two stages. Tomorrow will mostly be a cloudy day and rain is forecasted for most of the day. However, there is a chance that it will stop in the afternoon, meaning that the riders may actually have dry conditions for most of the stage. The maximum temperature will be just 15 degrees. There will be a moderate wind from a westerly direction. This means that the riders will mainly have a crosswind in the first part of the circuit before they turn into a headwind for the first climb. Then there’s another crosswind section before the riders mainly have a tailwind in the final part. From the bottom of the final climb, there will mainly be a crosswind but it will play no role as the riders are riding in the centre of Bern. Alexander Kristoff finally managed to open his account in a very tough uphill sprint that proved how strong the Norwegian is in these finishes. First the Katusha lead-out train showed its strength by positioning Kristoff perfectly and then he could do one of his preferred long sprints on a finishing straight that suited him down to the ground. Peter Sagan lost out to a rare case of poor positioning as he decided not to follow teammate Daniele Bennati but Kristoff also had a very strong second kick when Sagan seemed to be passing him in the end. Sagan no has one chance left if he wants to take that elusive 12th stage victory that would make him the sole leader in the battle for most ever stage victories in the Tour de Suisse. However, he could probably not have designed a better course for his final attempt as the penultimate stage is tailor-made for a classics riders like Sagan. However, it won’t be easy for Tinkoff-Saxo to control a circuit whose hilly terrain makes it perfect for attacks. Profiles in the Tour de Suisse can often be pretty deceptive as the rolling Swiss terrain can be harder than the graphics show. That was definitely the case in stage 4 where Orica-GreenEDGE did a lot of damage on the many small climbs that didn’t really feature in the official information. Hence, it is hard to gauge just how hard tomorrow’s finishing circuit is. Based on the pure facts, the climbs are not very hard. The first categorized ascent is very steep but short while none of the remaining ascents have insurmountable gradients. However, there aren’t many flat sections on the course which is almost always up or down and the riders will face 1906m of altitude over a distance of just 152.5km. More importantly, the final climb summits just 2.5km from the finish and there will be no subsequent descent that can allow the riders to recover. Even though the finale is flat, the stage should be a lot harder than today’s and most of the fast finishers will be ruled out. The combination of hilly terrain and a very technical finale – maybe even with wet roads – should make it a treat for Sagan. We were a bit uncertain about how committed he would be to another victory after having already taken two but today he clearly showed that he is hungry for more. There is no reason that he will go all out in a quest to win tomorrow’s stage but it won’t be easy for Tinkoff-Saxo to control the stage. The circuit is tailor-made for attacks and the Russian team cannot expect to get too much help. Many riders will be uncertain about what to expect and so they won’t commit themselves fully to the chase. In fact, only Tinkoff-Saxo, Orica-GreenEDGE, BMC and Giant-Alpecin can be expected to do the work and whether the latter three teams will lend a hand will depend on the composition of the breakaway. Today’s stage got off to a very fast start as many riders were keen to attack. Tomorrow’s stage is much harder and the start is more difficult to control. This means that the first part of the race will be very aggressive and there is a very big chance that the break will be even stronger than it was today. Most teams will want to put riders into the group to avoid having to chase and even Tinkoff-Saxo may have to opt for that tactic if the situation gets to uncontrollable. Hence, it won’t be easy for Tinkoff-Saxo to bring the break back and there is a big chance that tomorrow’s stage will be won by the early escapees. Even if the early move is caught, the lumpy finale is perfect for attacks and it will be hard to prevent strong riders from escaping in the finale. Hence, there are three possible scenarios: a sprint finish from a reduced group, an early breakaway that decides the stage or a late attack that pays off. All scenarios are realistic but the most likely outcome is a sprint. Tinkoff-Saxo have proved that they are fairly strong and even though the terrain is hard, it is not very difficult. Tinkoff-Saxo have strong riders for these hills, most notably Rafal Majka who is getting better and better, and they should be strong enough to bring it back together. On the final climb, there will definitely be attacks and here Sagan will probably have to respond himself. He has been forced to do so in past races and this has left him with less power for the sprint. However, that won’t be too much of a problem in this finale which is very technical. Here it will be more about positioning, acceleration and bike-handling skills than actual speed and in those conditions Sagan is very hard to beat. He proved so when he won stage 6 and if things are still together at the top of the final climb, he will be the obvious favourite. Hence, he is our stage winner pick. Michael Albasini has been riding strongly in this race but he has not been able to show much. There is no doubt that he has made tomorrow’s stage his big goal in this race as it is tailor-made for his characteristics. He can play his cards both in a sprint or in a breakaway but he knows that Sagan will be very hard to beat in a direct battle. Hence, he will probably do his utmost to join the early move and with his strong legs and great skills in this terrain, there is a big chance that he will make it. Albasini is a master in finishing it off in breakaways in this kind of stages and has won stages in virtually all WorldTour stage races. He is probably the best stage hunter in professional cycling and he is almost impossible to beat if he joins the right break. He has all the necessary skills to win this stage with his fast sprint, great tactics and good climbing legs. Tomorrow could be Albasini’s day. A few days ago Greg Van Avermaet made it clear that this stage was his next big goal. As a classics specialist, the Belgian is perfectly suited to this circuit and like Albasini he has numerous cards to play. He can join an early break, try his hand in the sprint or attack in the finale and he has the skills to finish it off in all scenarios. 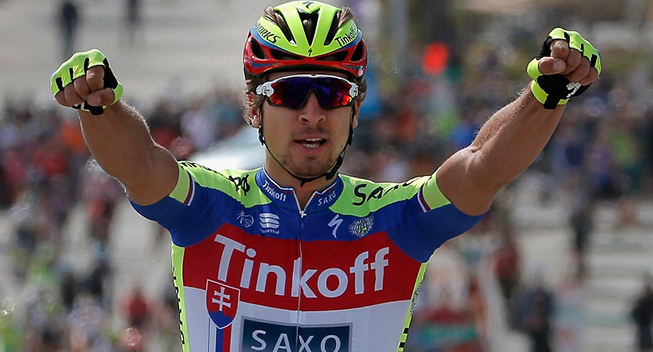 It will be hard for him to beat Sagan in a direct battle and so he will probably have an aggressive approach. His great performance in the Tour of Belgium proves that he is in very good condition and this makes him one of the favourites for this stage. As it has often been the case, the race has been a huge disappointment for John Degenkolb. The German is unwilling to take too many risks in the sprints and this has made it impossible for him to be a contender in the last two stages. However, he is clearly in great condition as he has been very comfortable on the climbs and he should be able to finish with the best in tomorrow’s finale. On paper, he is faster than Sagan but in this kind of technical finale it will be hard to beat the Slovakian. Alexander Kristoff came up short in stage 4 and has admitted that he has not been feeling very good in this race. However, his legs have now come around and he is feeling better. This means that he could find himself in contention in tomorrow’s stage even though the finale will be hard for him. He won’t be able to follow the very best but if he can position himself well near the bottom he may be able to move up in time for the sprint. The technical finale doesn’t suit him but if he can muscle himself to the front before the final turn he could make it two in a row. We have been very impressed by Jan Bakelants who seems to be riding really well at the moment. The Belgian is one of the most aggressive riders in the peloton and he knows how to win stages from breakaways. The hilly terrain suits him well and due to his good condition there is a big chance that he will find himself in the early break. He is not very fast in a sprint but with a late climb he has the perfect launch pad for a late attack. Today Michal Kwiatkowski decided to test his legs but tomorrow he will probably save energy for the time trial. Instead, Zdenek Stybar could be the Etixx-QuickStep attacker. The Czech hasn’t looked very strong in this race but like Kwiatkowski he may have taken it easy to be fresh for the Tour de France. Tomorrow’s stage suits him really well with a technical finale and short, steep climbs and he has a fast sprint to finish it off. Martin Elmiger will be doing his last race in the Swiss champion’s jersey and he will love to show it off in the best possible way. After a strong start to the race, he has seemed to be slightly fatigued in the last few stages but there is no doubt that he is good condition. He is strong in hilly terrain and is very fast in a sprint. Sep Vanmarcke has arrived at this race after his first ever altitude training camp and he is clearly fully ready for the Tour de France. Today he did well in the uphill sprint and tomorrow he will be keen to attack. Compared to the likes of Albasini, Van Avermaet, Bakelants and Stybar he may find the terrain a bit tough but he is clearly climbing very well at the moment. His fast sprint and good acceleration makes him well-suited to the finale. His teammate Paul Martens may also try his hand but the German doesn’t seem to be at 100%. Simon Clarke had a successful Giro d’Italia and he still seems to be riding strongly. The Australian should find the hilly terrain to his liking and Orica-GreenEDGE won’t allow themselves to miss out on the break. Clarke will be one of the best cards and he has the fast sprint to finish it off. Gianluca Brambilla and Michael Golas are another two Etixx-QuickStep riders who are suited to this stage. Both are good climbers and fast sprinters and as the stage is probably too hard for Cavendish, they will be free to attack. The same goes for an in-form Matteo Trentin who could also test himself in the sprint. Italians Davide Rebellin and Marco Marcato are riding for the two wild card teams and they will do their utmost to show themselves in the final road stage. Both have shown solid condition in this race. The stage is probably a bit too easy to suit Rebellin perfectly while Marcato may find the finale a bit too hard if he is in a very strong breakaway. Finally, Michael Valgren deserves to be mentioned. If Tinkoff-Saxo decide to put a rider in the break, the Danish champion will be their best card. He likes this terrain and is constantly getting stronger. This will be his final race in the Danish champion’s jersey and like Elmiger he would love to end his time as the national champion with a victory.